How does Apollo Ohno make his way into the latest episode of the Indiana Home Cooks podcast? Listen and find out. My good friend Katy Eberle stopped by earlier this month so we could catch up on some of our latest food and cooking adventures. Besides Apollo, we discussed my recent trip to New Orleans, and how beignets have been a part of my life for 23 years. We shared a couple of recipes–Katy’s Cauliflower Pizza and my Mixed Berry Compote. And we considered one chef’s advice for stepping outside your comfort zone when it comes to home cooking. Put 6 oz. of frozen raspberries in saucepan. Add water and sugar, and put on low heat on the stove. As berries begin to thaw, turn up to medium heat. Bring up to a simmer and let mixture cook until berries break down and juice thickens a bit. This takes about 10 minutes. Carefully add the rest of the mixed berries, stir, and return to LOW heat. Cook just long enough to thaw the berries. Turn off heat, add a squeeze of lemon and stir. Serve warm on pancakes or waffles. Let cool and store in a glass jar or plastic container in refrigerator. Will keep 2-3 weeks. Can also be served cold with plain yogurt. Have pizza toppings of your choice (sauce, cheese, meats, herbs, etc.) prepared and ready. Preheat oven to 450 degrees. Line baking sheet with parchment paper. Coat paper with non-stick spray. In a food processor pulse cauliflower florets until the consistency of rice. Put riced cauliflower in large mixing bowl with the remaining ingredients, and stir to combine. Spoon and smooth mixture into two (8-inch) circles on prepared baking sheet. Bake until browned on bottom, about 20 minutes, then flip crusts over. Bake about 10 minutes more. Remove from oven, top with your pizza toppings of choice, return to oven and bake until cheese is melted. To brown the toppings, but under broiler for a few minutes (optional). Makes 4 servings. Adapted from Weight Watchers. Happy Birthday, New Orleans! Celebrating it’s tricentennial, 1718-2018. Cafe Du Monde on a chilly morning with the awnings down. Hauling out donuts & coffee. For low income individuals and families, here in my part of Indiana and in every community, it’s a struggle to put good nutritious food on the table every day. From time to time on the Indiana Home Cooks podcast, we like to feature individuals and organizations doing the real work of helping those in need. On the “Food Finders” episode of Indiana Home Cooks, available here…and here, we highlight the work of Food Finders Food Bank, in Lafayette, Indiana. I had heard of Food Finders for many years since moving to West Lafayette. But I never really understood what the organization did, other than collect donations of food and then distribute it to those in need in the community. Yes, that’s at the heart of what Food Finders does but it’s service to low income individuals and families goes way beyond that, and across a sixteen county region! On the show we hear from Katy Bender, president and CEO of Food Finders, explain how the organization has expanded it’s services beyond the distribution of food to helping low income individuals and families make their food dollars go further, and much more. We hear from a nutrition education specialist with Purdue Extension, Barb Bunnell, on some of the ways she teaches low income clients to get maximum nutrition by using their “SNAP” vouchers (formerly called food stamps) and the food handouts at local food pantries. To learn more about Food Finders, visit their website, food-finders.org. To hear more ways the people of the Lafayette community are helping those most in need, specifically the homeless, check out the Feeding the Hungry episode of the Indiana Home Cooks podcast. Below are a few pictures to go with the “Boiler Gold” episode of Indiana Home Cooks. 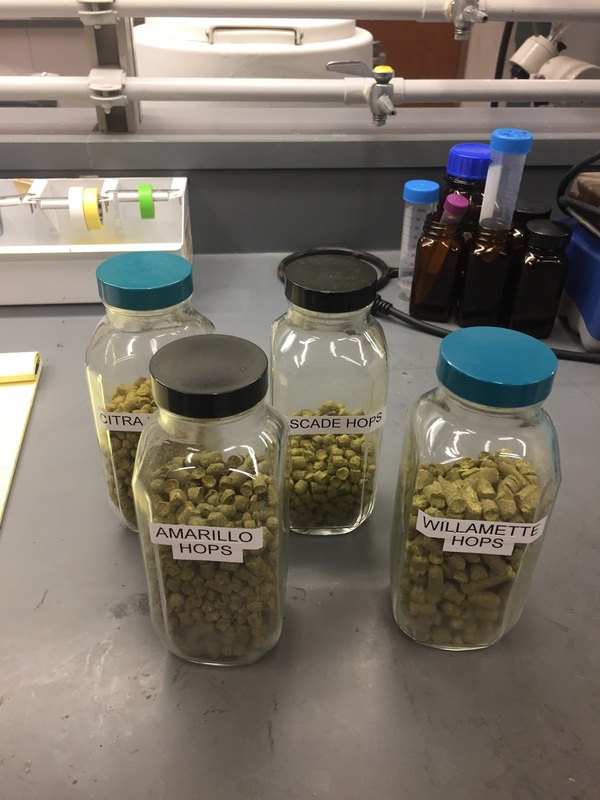 Thanks to Brian Farkas, head of the Department of Food Sciences at Purdue, and Jean Jensen, manager of the Hops and Brewing Analysis Lab at Purdue University, for providing me with background on the development of the Boiler Gold beer. They were very generous with their time, talking about the work going on in Food Sciences and the lab, and showing me around the facilities. And did you know you can listen, and subscribe to the Indiana Home Cooks podcast, at Apple Podcasts. You can also find the show on Stitcher. Use whichever platform is most convenient. Please subscribe (it’s free) and leave a review. It helps others find the Indiana Home Cooks podcast. Thanks! 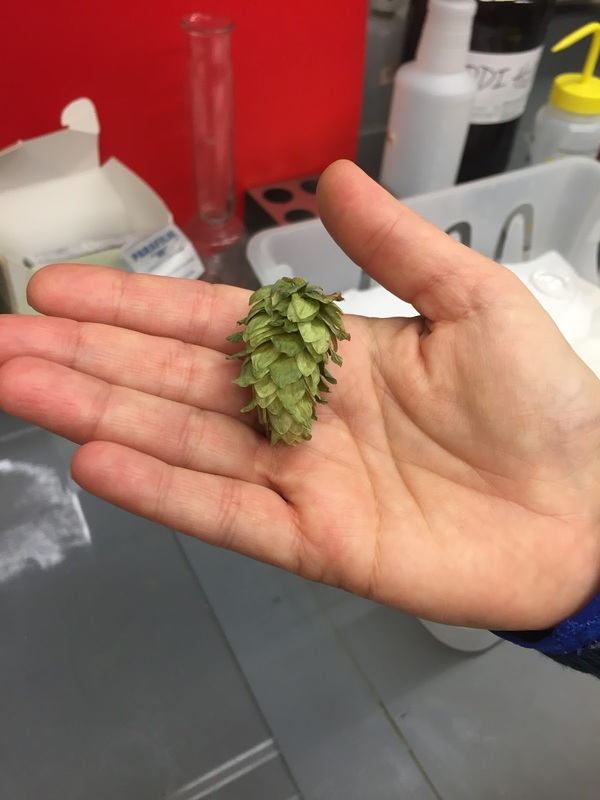 This is what a hop cone looks like. Hops that have been pelletized. They are used in brewing in this form, or as intact cones. This says it all. 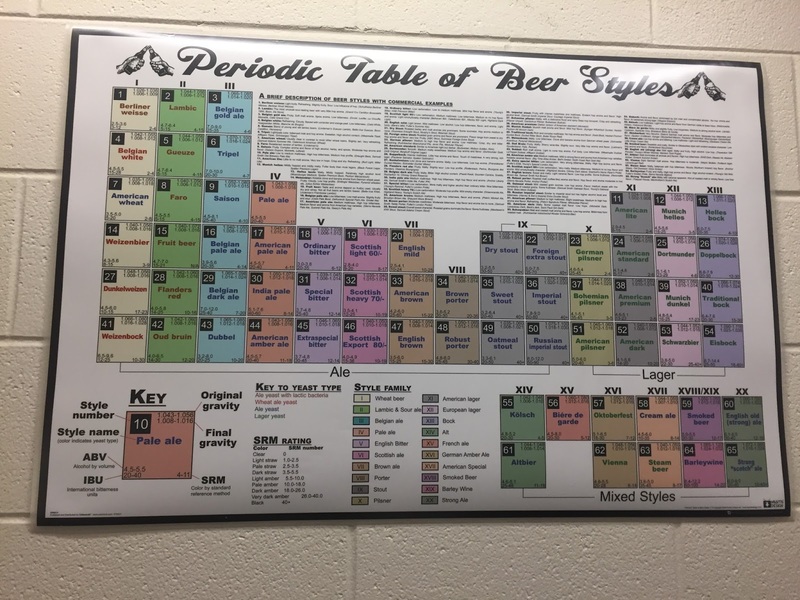 Find where your favorite beers stack up in the Periodic Table. I’m not a very good blogger. Christine and I had nearly finished our beers before I remembered to take a picture. 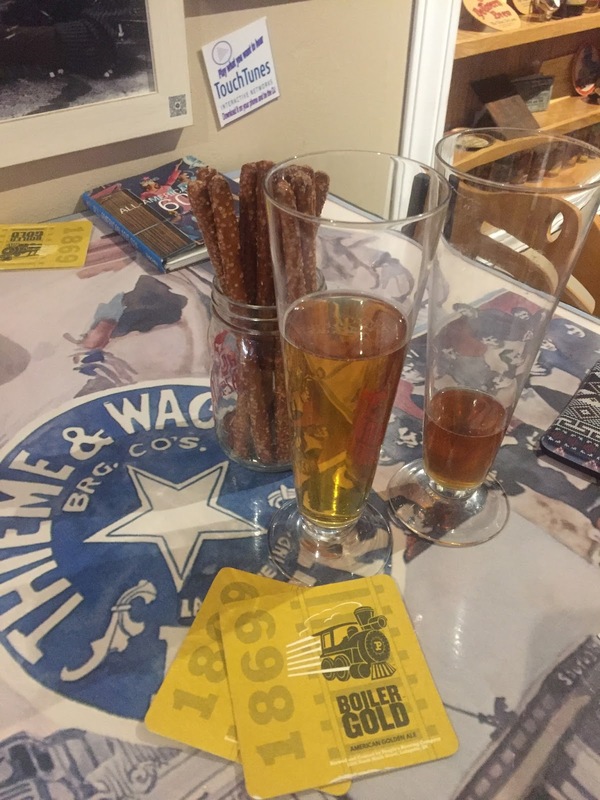 Boiler Gold on the left, Thieme & Wagner Bock on right. Both were delicious!